Happy Birthday to me! As part of my birthday present, my roommate Klaxman switched his early shift for my late shift so I was able to go to Numazu summer festival with The Penpal. I went to her house after work, and her family helped me to get dressed in my new yukata which we had bought a few days earlier. Overall it was comfortable, but the bottom of my robe was fairly tight around my legs. I’m not a tall person, so I usually have a long stride in order to walk quickly. The bottom of my yukata prevented me from taking big steps, which took a lot of practice to get used to. Things got more difficult when I put on my geta; thong sandals with wooden blocks on the bottom. The combination of the yukata and geta slowed me down quite a bit. Stairs were a very unfriendly sight for my restricted legs and awkward wooden sandals. When crossing the street to get to the train station I held on to the railing tight to avoid rolling an ankle or tumbling down the stairs and wiping out the rest of the people like a pale bowling ball. We survived the train ride and walk into Numazu’s overcrowded downtown area, and watched an amazing fireworks show surrounded by tens of thousands of people, most of whom were also wearing yukatas. If you ever have a chance, see fireworks in Japan; they blow away anything I have seen from back home, with the exception of Canada Day fireworks in tiny Wabigoon, Ontario, a town that seems to spend their entire budget every year on airborne explosives. Numazu’s fireworks are launched from either side of a central bridge, offering great views from downtown and along the riverside, and amazing views if you are lucky enough to be on the bridge. It was a very cool experience to see Numazu festival in traditional Japanese clothing. When I first moved away from Canada to teach English, I wanted to experience Japanese culture. Thanks to my wonderful fiancee and her family I have been able to participate in things that I wouldn’t have dreamed of when I left Winnipeg behind. Although I had a fun evening, I was very, VERY happy to get back into my comfortable jeans and flat, safe shoes. Today I went out with The Penpal and her parents. 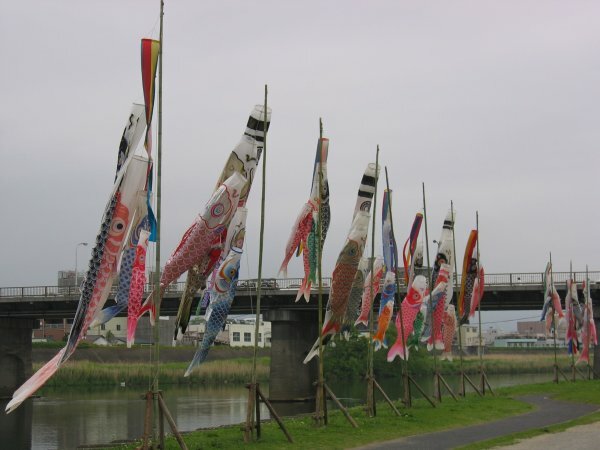 The plan for the day was to see some of the impressive carp banners along the river, and then to go to a historical site in Izu. Children’s day is a holiday in Japan to celebrate the happiness of children and to express appreciation to mothers. Families with young boys hang decorative carp banners outside. The holiday used to be known as “Boy’s day”, and even after it changed to “Children’s day”, there are still carp banners for boys only. The Penpal and her parents picked me up at my apartment, and then drove us to the nearby Kano river. We parked and walked along the riverbank to see some of the impressive banners on display. As we approached a bridge, we came across a large gathering of people who were all listening to someone on a small stage (almost a literal soap box) talking through a megaphone. The small crowd was listening enthusiastically to the energetic speaker. This was a bit unusual for me to see in Japan. I asked the Penpal what we were watching. She wanted to explain, but didn’t know the correct word in English. As she started to look for her electronic dictionary, I used my observation skills to try to find some context to the situation. I realized we were watching a May Day communist rally at about the exact time that The Penpal had located the word “communism” in her electronic dictionary. Score one for observation skills! The rally was organized by the Japanese Communist Party. A few minutes later, the communists began marching towards the bridge playing some folky sounding music (which I assume was about workers) through a loudspeaker. Right at the same time, the right wing Uyoku showed up in one of their trademark black vans to annoy the communists. Uyoku dantai means “right wing groups”. They usually drive around in black vans with giant Blues Brothers style loudspeakers on the roof. The speakers either feature someone loudly complaining about all of the usual things that ultra-nationalist groups complain about, or they blast dramatic sounding music about how great the Emperor is. For the record, I probably have a lot more in common with the Communist rally than the ultra right wing Uyoku groups, but the Uyoku have WAY cooler music. We went to the river to see some carp banners, but ended up seeing a rare open expression of politics outside of an election campaign. It was a great experience to learn more about Japanese culture.